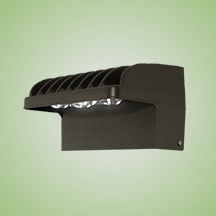 The heavy duty housing is constructed of die cast aluminum. The optical assemblies are sealed in place using a silicone gasket for weather tight protection. ETL listed for wet locations (IP64). Additional IP66 rating available upon request. Available in a high output 2 or 4 LED system in 5000K Cool White (+/- 500K) or 4100K Neutral White color temperatures propagated with Philips Lumileds LUXEON® M LED’s. Available with 90-300V 50/60 Hz Class II power supply. LED’s rated for over 50,000 hours at 25°C ambient temperature. 0-10V dimming standard. Built-in surge protection up to 6 Kv. Built-in Active PFC Function >95%/Full load. LED Power Supply conforms to UL1310 Class 2 and UL8750 standards and is IP67 rated for wet locations.